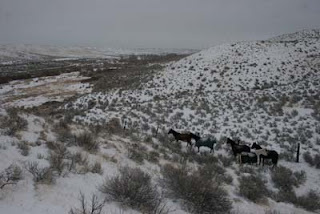 One person in Owyhee wakes up, bundles up, looks out the window: Snow, Cold. Wimpers. Gets a cup of coffee and brownie and goes back to bed to curl up with a book and the dogs. Dreams of warmer climes and how one might get there if the roads ever again become driveable. One person wakes up, bundles up, steps outside: Fresh snow, Cold. Inhales a deep breath. Holds it. Gets intoxicated. Snowflakes bombard cheeks. 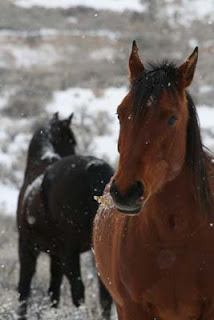 Does a snow dance while feeding the horses. 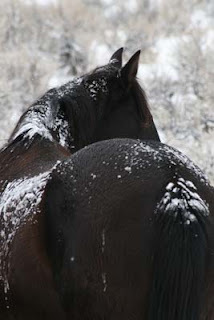 Buries head in a thick warm equine coat while the snowflakes fall in human hair. First person sticks pins in second person's effigy. 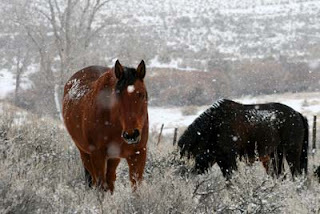 By first person: "The horses look cold and unhappy." By second person: "The horses look warm and happy!" You've probably guessed that I'm the second person. 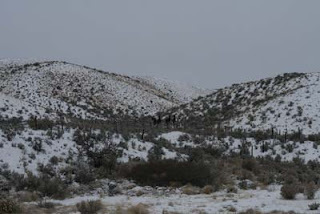 The winter here in Owyhee is glorious! I can't get enough snow. 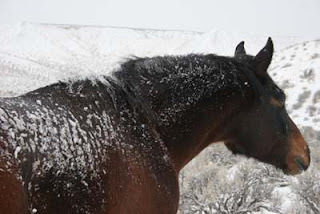 The horses only look sad about not getting 20 servings of grain a day and 85 pounds of alfalfa every day, but that has nothing to do with the winter. Every morning, like clockwork, the Three Musketeers - Rhett and Jose and Mac, are standing by the fence waiting for their grain. They were gone this morning with Dudley and Finneas. It had snowed about 2 more inches overnight, and they'd been gone a while - no fresh tracks in the snow around here, and a layer of snow on the big hay bin that they are usually crowded around. I bundled up and hiked up-canyon to look for them. I saw no fresh tracks going up that way at all - so they'd indeed been gone a while. I walked a mile up the canyon in the 3" of snow before I finally saw them, across the creek, near the fence line - behind some hills out of the wind. I was so hoping that when they saw me and heard me calling to them, they'd come galloping down in snow along the creek toward me so I'd get these fantastic galloping-in-the-snow pictures, but oh no, as soon as Rhett saw me, he thought I was either 1) a monster or 2) going to catch him. They almost took off running in the other direction as I approached. They teased me by finally walking my way a little bit, then stopping. I eventually had to give up and go up with them. They actually have plenty of grass up there, easy enough to get to, and they are sheltered by the wind there. They sure didn't look unhappy to me, even though they all had snow and ice on their coats or blankets. I sure wasn't unhappy, standing ankle-deep in snow, in the falling snowflakes, taking pictures on a beautiful Owhyee winter day. More snow is in the forecast. Bring it on! Winter just depends on your perspective. But don't ask for my take on a hot summer day.